inging of bells, men's voices from afar. - Gurnemans: The hour is come: midday, as before. Follow me." Parzival, armed by them both, solemnly takes up the spear and, with Kundry, follows Gurnemans. - As the singing swells and the sound of the bells grows louder, the scene gradually changes as in Act 1. In the corridors - processions of knights dressed in mourning. Nearer at hand - lamentations for the dead. - A funeral procession. - Then, back in the Great Hall. 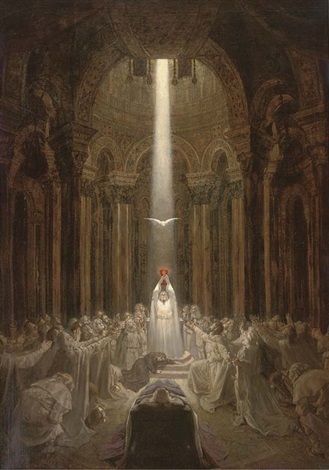 Dirges sung by bass, tenor and soprano voices: in place of the table before the baldachin, the catafalque. 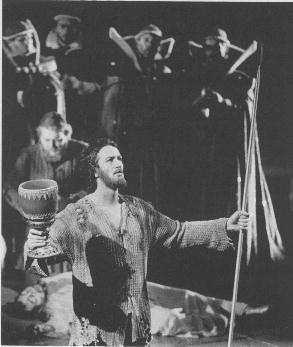 Poul Elming as Parsifal in the Royal Danish Opera production, directed by Harry Kupfer. ©Royal Danish Opera. 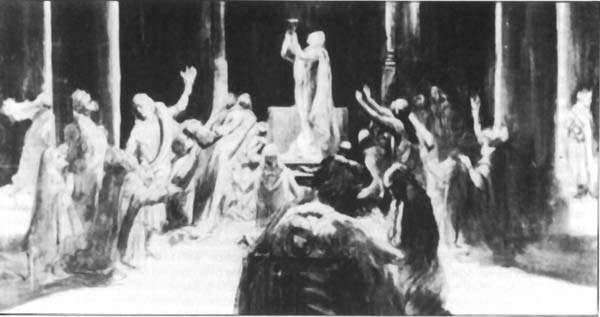 Above: the closing scene of Parsifal as designed for the first staging by Paul von Joukowsky.